When it comes to some foreign films, I must supplement my observations with comments from others in my class at the Bryn Mawr Film Institute. 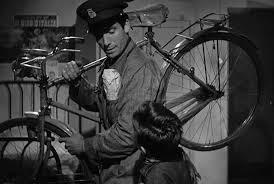 This 1948 critically acclaimed movie, directed by Vittorio De Sica, which is also known as The Bicycle Thief (although the plural version is the more accurate translation), is a prime example of Italian neorealism filmmaking. 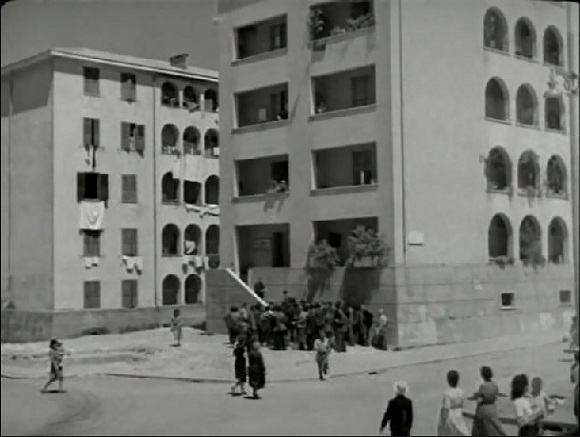 It emphasizes the devastation and poverty that existed in Italy following World War II. 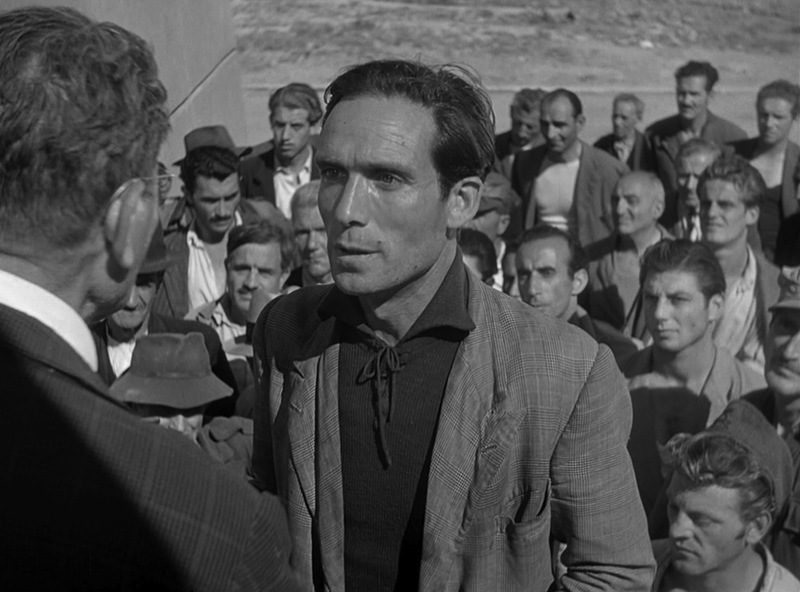 The story begins by showing us a rundown area in Rome where men stand in a crowd on stone steps outside a building. They are there hoping to get jobs. The scene may remind one of a subsequent movie, On the Waterfront, where the dock workers bunch together, hoping to get paid for at least one day’s labor. Here, the men move up the stairs, and then must retreat as a low-level bureaucrat emerges and walks toward the steps to dole out the meager offering of employment. One class member stated that this image implied how the men’s efforts at moving ahead in life meet the push-back of an inept bureaucracy. 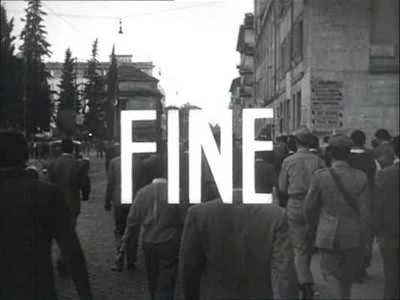 Indeed, there is a Kafka feel to the red tape world here as shown by the inadequacy of the police to even attempt to find the bicycle thief, and the inability of the government to deal with the country’s poor multitudes. 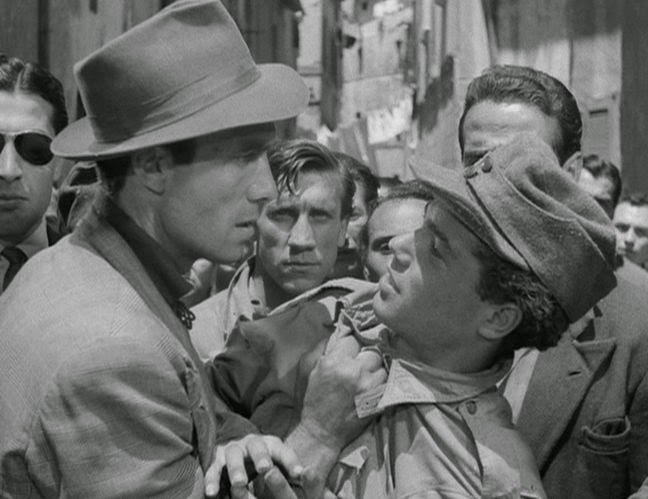 De Sica used amateur actors to emphasize the gritty nature of his tale. The main character is Antonio Ricci (Lamberto Maggiorani). He is also at the site where the unemployed men are, but he is resting at a distance away from the crowd. When the government worker calls his name, one of Ricci’s friends goes out of his way to tell Ricci that there is a job for him, and brings him to the front of the group. Class members pointed out that this scene illustrates that Ricci is a detached individual, who must be goaded into action. 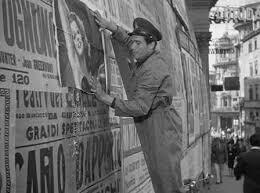 The job offered to him requires that he have a bicycle to travel around the city to hang posters. He says that he has the means of transportation, but, unfortunately, he has pawned his bike. He appears helpless as to deal with his predicament. 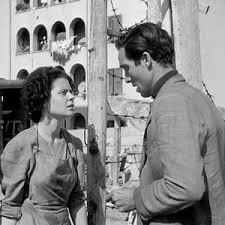 In contrast, when he tells his wife, Maria (Lianella Carell), about the work opportunity, she immediately steps up, gathering bed linens to pawn so that they can use the money to retrieve his bicycle. 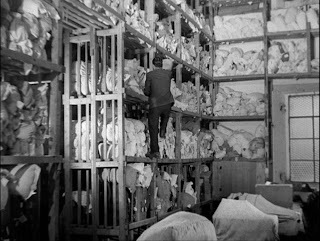 The place where Maria goes to get money for her bed coverings contains a huge room with numerous shelves filled with similar goods reaching toward a high ceiling. The effect of this shot emphasizes how widespread the poverty is because so many families have exchanged basic possessions for a minimal amount of payment. Given the title of the film, we know that someone will steal Ricci’s bicycle. But, De Sica teases us as to when this act will occur. There is one scene where he asks a boy to watch the bike, and we think that is when it will be taken, but we are wrong. 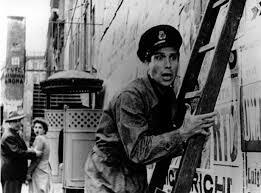 While Ricci is hanging up a poster, a young man makes off with the bicycle. The poster depicts Rita Hayworth, highlighting the contrast between the glamorous escapist world depicted in Hollywood movies and the harsh reality documented in De Sica’s film. The movie shows how religion, or at least a belief in something existing on a higher plane than what a deprived life has to offer, does not provide relief to these suffering people. A scene in a church, a place where human goodness might flourish, has Ricci looking there for his thief. The exit out of the place of worship is through a room crammed with religious icons, implying that spiritual relief has been put into storage, and is not currently in use. The inhabitants of this desolate world still try to find other-worldly help in alternative places. They, including Maria, and later, the at first doubting Ricci, go to a fortune teller who provides useless truisms for a price. Ricci’s self-pity makes him oblivious to the suffering of others. He loses track of Bruno, and is only shocked into parental concern when he hears that a boy is drowning in the river close to where they were walking. He is relieved that Bruno was not the one in danger, but he could have been. 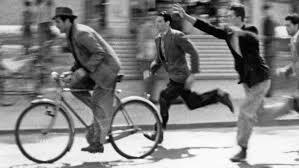 When he finds the young man who stole his bike, it turns out that the youth is sickly, and experiences a seizure (although some have felt that the spell was a ploy, that impression may be viewed as a cynical take from today’s viewpoint). An exploration of his house to look for the bicycle, which is not there, reveals that the young man and his mother live in even worse conditions than does Ricci’s family. Bruno, on the other hand, is vivacious and humorous, in stark contrast to his morose father. It is painful to watch Ricci slap his son in one scene. 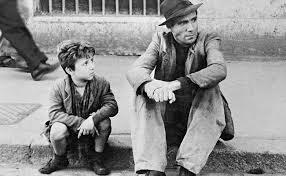 It seems that the father is annoyed with Bruno because he resents the child’s playful nature and his happy innocence which remind Ricci of how he has lost the childlike hope for the future. He tries to make it up to the boy by taking him to a restaurant, and, for a moment, he seems to forget about his cares, and tries to enjoy himself. But, his envy of a family which is enjoying a more expensive feast brings him back to his default attitude of being preoccupied with his deprived life. In the end, Ricci is near a stadium where there are many bicycles gathered in one place belonging to those inside watching a sporting event. He seems to agonize over what he is about to do. He decides to steal a bike which is by itself outside of a store. However, people see what he has done, and he is overtaken by a mob. To Ricci, there are all of these bikes, and he is being unjustly deprived of at least having just one. But, the owner of the bike Ricci tried to steal says that it was all that he had. Again, Ricci has allowed his own misfortune to lose sight of the problems of others. He sent Bruno away, perhaps ashamed of what he was planning, or maybe he didn’t want his child involved. However, Bruno did not leave, and his innocence is soiled by the humiliation of seeing people apprehend his father for the crime. 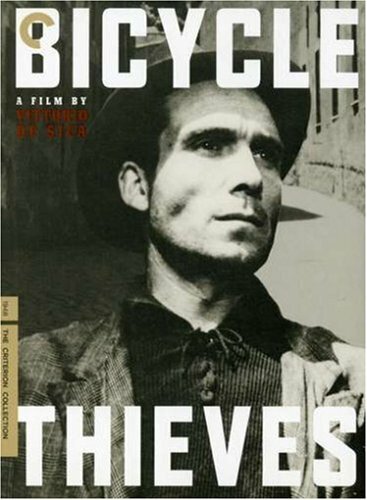 The desperate poverty which led to the first theft carried on to the second one, so the movie suggests that the damage to society will be ongoing unless the quality of life can be improved. The class members pointed out that there are those in the story who demonstrated a less selfish behavior than did Ricci. The man who alerted Ricci that he was called for a job at the beginning of the film showed caring for his friend. The neighbors living near the accused bicycle thief defend the youth, who may be ill and is extremely poor. The owner of the bicycle Ricci attempted to steal decides not to press charges after seeing how the father’s action has traumatized Bruno. The last shot is that of Ricci and his son walking away, hand-in-hand, but they are two moving in a large crowd of people going in the same direction. Perhaps the film is offering the belief that there can be progress when we act for the good of the many. The next film is Becket. 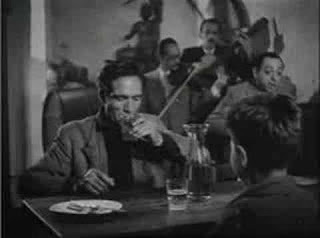 OK, the thing about that movie, a thing enough to make it a Great, is that chemistry between Dad & Son, the energy, or how the camera manages to get forgotten, so that that scene at the cafe, father & son consuming ambrosia together, is so primal. And the writing. That that scene is so set up, by all the heartache difficulty, the guy just wants to make ends meet for his wife & son, be a man. So that it's so brief, brutal a moment, when he takes someone else's bike. Luv, luv this great movie. KEITH JOWETT, FROM FACEBOOK FILM LOVERS UNITE! GROUP.